Shmuel Yosef Agnon (July 17, 1888 – February 17, 1970), born Shmuel Yosef Czaczkes, recipient of the 1966 Nobel Prize for Literature, was the first Hebrew writer awarded the prize, which he won jointly with poet Nelly Sachs. He was awarded the Bialik Prize twice, in 1934 and again in 1950 and the Israel Prize in 1954 and again in 1958. One of the central figures in modern Hebrew fiction, Agnon was born in Galicia, later immigrated as a Zionist to Israel, and died in Jerusalem. Agnon, called by many "a man of unquestionable genius" and "one of the great storytellers of our time," is one of the most widely translated Hebrew authors. His stories dealt with the most important psychological and philosophical problems of his generation. Generations of writers have been influenced by his unique style and language. An observant Jew throughout most of his life, Agnon was said to be able to capture "the hopelessness and spiritual desolation" of a world standing on the threshold of a new age. He was praised for his "peculiar tenderness and beauty," for his "comic mastery" and for the "richness and depth" of his writing. His contribution to the renewal of the language contributed greatly to all subsequent Hebrew writing. He was born to an affluent and urbane family where traditional Jewish culture dwelt side by side with modern European culture. While his father taught him rabbinical legends, his mother read him German stories. His father, Shalom Mordechai Halevy, was ordained as a rabbi, but dealt in the fur trade. Young Shmuel did not go to school; he was educated by his parents. When he was eight he began to write in Hebrew and Yiddish, and read extensively the works of the Jewish enlightenment, the Haskalah. At the age of fifteen his first creative work was published, a poem in Yiddish about the Kabbalist Joseph della Reina. He continued to produce poems and stories in Hebrew and Yiddish in manuscripts that were published in Galicia. In 1908 he emigrated to Jaffa, Israel, which was then an Ottoman port. By doing so, he reached the land of Israel with the Zionists of the Second Aliyah. There he abandoned the Jewish religious way of life for a time, but came back to the religion and adhered to it for the rest of his life. By the time he had reached Israel, at 20 years of age, he had published some seventy pieces in Hebrew and Yiddish. The first work that he released in Eretz Israel was "Agunot" (Forsaken Wives), published in the journal Ha`omer in 1908, using the pseudonym Agnon, derived from the name of the story. It became his literary name, and in 1924, his official surname. In 1910 this was translated into German. Since then, his works have been translated into numerous languages. In 1912, at the initiative of Yosef Haim Brenner, he published the novella And the Crooked Shall Be Made Straight. In 1913, drawn by Germany`s lively Jewish cultural life, Agnon left Eretz Israel. While there, in 1920, he married Esther Marx and the couple had two children. While first in Germany, Agnon gave private lessons and worked as an editor. Later, a wealthy Jewish businessman, Zalman Schocken, became his patron and published his works, freeing him from financial worries. From that time on, all of his works were published by Schocken Books. His short stories regularly appeared in the newspaper Haaretz, also owned by the Schocken family. While In Germany he wrote several stories and collaborated with Martin Buber on a collection of Hasidic stories that influenced Neo-Hasidism. 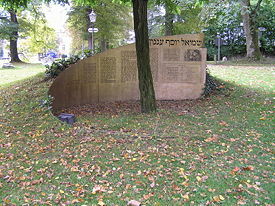 Agnon read German and French literature extensively, and became a member of a circle of Hebrew writers in Hamburg. In 1924 fire swept through his home and destroyed all his books and manuscripts, including the novel, "In the Bond of Life," whose imminent publication had already been announced. This traumatic event appears occasionally in his stories. Later that year, he returned to Jerusalem permanently, establishing himself in the Talpiot neighborhood. In 1929 his library was destroyed again. In 1931 the novel The Bridal Canopy was published, making Agnon a central figure in Hebrew literature. In 1935 the novella A Simple Story was published, set in Buczacz at the end of the nineteenth century. In 1945 Yesteryear was published, a novel set in the Land of Israel at the beginning of the twentieth century. Several of his works were published posthumously by his daughter, Emmuna Yaron. Agnon was a deeply religious man and an observant Jew who was identified with the Zionist movement. His studies as a youth of the works of the Jewish enlightenment, the Haskalah, and its studies of religious texts and languages had a deep influence on his success in the literary world. "I belong to the Tribe of Levi; my forebears and I are of the minstrels that were in the Temple, and there is a tradition in my father's family that we are of the lineage of the Prophet Samuel, whose name I bear." The following story shows how greatly Agnon, the author and the man, was revered. He complained that the traffic on the street next to his house, in the Talpiot neighborhood of Jerusalem, disturbed his writing activity. In response the city closed the street to vehicular traffic and posted a sign saying, "No entry to all vehicles, writer at work!" Agnon died in Jerusalem on February 17, 1970. After his death his daughter, Emmuna Yaron, continued to work to publish writings from his legacy. More of his books were published posthumously than during his life. Agnon's archive was transferred by his family to the National Library in Jerusalem. His house became property of the city of Jerusalem and is open to visitors. Agnon is considered the most researched author in Hebrew literature. A substantial number of books and articles dealing with his works have been published. Among his most outstanding scholars are Baruch Kurzweil, Dov Seden, and Dan Laor. Agnon is depicted on the two designs for fifty-shekel notes that first appeared in 1985 and 1998. Bar-Ilan University has made a computerized concordance of his works in order to study his language. The wellspring of Agnon's works is Judaism in all of its aspects, such as customs, faith, and language. Agnon gives every aspect his own touch and a unique commentary, expressed in his writings which are unique in their content and language. Agnon was also influenced by German literature and culture specifically and European literature in general, which he read in German translation. The budding Hebrew literature also influenced his works. Some of his protagonists are Zionists of the Second Aliyah. Galicia: in the books The Bridal Canopy, A City and the Fullness Thereof, and A Guest for the Night. Germany: in the stories "Fernheim," "Thus Far," and "Between Two Cities." Jaffa: in the stories "Oath of Allegiance," "Yesteryear," and "The Dune." Jerusalem: "Prayer," "Yesteryear," "Ido ve-Inam," and "Shira." Agnon's substantial selection of stories has been published in various collections. Some of his works, such as The Bridal Canopy, And the Crooked Shall Be Made Straight, and The Doctor and His Ex-Wife, have been adapted for theater and performed in Israeli theaters. Some of them have aired on Israeli television. "And the Crooked Shall Be Made Straight"
"In the Heart of the Seas"
"In the Prime of Her Life"
"The Two Sages Who Were In Our City"
"The Lady and the Peddler"
the satire "Chapters of the National Manual"
"Introduction to the Kaddish: After the Funerals of Those Murdered in the Land of Israel"
Shira (1971), a novel set in Jerusalem in the 1930s and 1940s. A City and the Fullness Thereof (1973), a collection of stories and legends about Buczacz, the town of Agnon's youth. Within the Wall (1975), a collection of four stories. From Myself to Myself (1976), a collection of essays and speeches. Book, Writer and Story (1978), stories about writers and books from the Jewish sources. The Beams of Our House (1979), two stories, the first about a Jewish family in Galicia, the second about the history of Agnon's family. Dear Esther: Letters 1924-1931 (1983), letters from Agnon to his wife. A Shroud of Stories (1985). The Correspondence between S.Y. Agnon and Z. Schocken (1991), letters between Agnon and his publisher. In 1977 the Hebrew University published Yiddish Works, a collection of stories and poems that Agnon wrote in Yiddish in the years 1903-1906. Days of Awe (1938), a book of customs, interpretations, and legends for the Jewish days of mercy and forgiveness: Rosh Hashanah, Yom Kippur, and the days between. Present at Sinai: The Giving of the Law (1959), an anthology for the festival of Shavuot. ↑ The American-Israeli Cooperative Enterprise - Jewish Virtual Library. 1988. Shmuel Yosef Agnon Retrieved January 21, 2008. ↑ The Institute for the Translation of Hebrew Literature Official Website. 2004. Shmuel Yosef Agnon Retrieved January 21, 2008. ↑ Liukkonen, Petri. 2002. 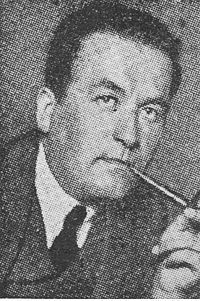 Shmuel (Yosef) Agnon (1888-1970) Books and Writers Website. Retrieved January 21, 2008. History of "Shmuel Yosef Agnon"
This page was last modified on 15 September 2015, at 16:37.